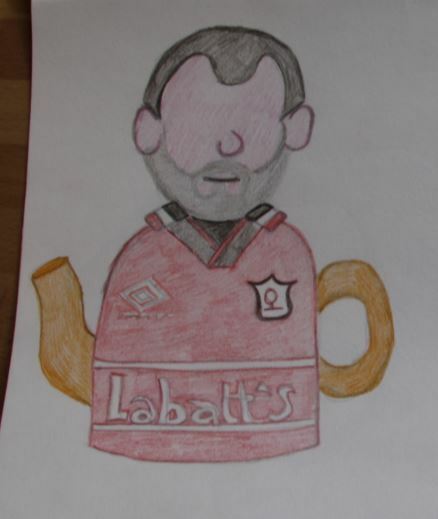 I have been asked to design a Nottingham Forest Football supporter tea cosy for a lady who wants to surprize her boyfriend. I have a photo I’m working from to create a look alike head and I have to design and knit a Nottingham forest football shirt for the main tea cosy – Oh crikey! Knitting is limiting and so I have said that the font of the text on the shirt will be a little off and more of an impression. Likewise, the football club’s emblem and the UMBRO logo are too detailed for knitting to re-create them accurately, but I shall have a go at more simplified versions. Well for a kick off I have all my yarn and a clear idea of my goal, so I guess I had just better start knitting!